You are here: Home / Printing & Publishing / Arts & Crafts Press, Inc. The independent sale of Arts & Crafts Press and Russ Press separately as well as a sale of both operations together were pursued. 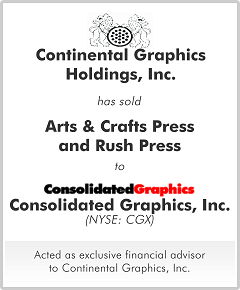 As the process developed, it became evident that Consolidated Graphics ("CGX") was both the most qualified and highest priced buyer. In addition, CGX had a desire to hire and provide growth opportunities for the management teams of both companies, providing for a smooth transition.